Safe, clean water is one of our most precious resources and the demand for it is constantly increasing. Conservation and protection from contamination are of prime importance in ensuring a continuing supply. In the Town of Mono, all households and commercial and industrial developments are serviced by private septic systems. Proper treatment and disposal of domestic waste water plays a vital role in maintaining the health of our environment and this is the responsibility of each individual owner of property on a private septic system. Homeowners should be aware of their water using habits to ensure that septic systems are not overloaded. A system which is properly operated can function safely and effectively for many years, but a system which is overburdened or not properly maintained can be dangerous to health and may contaminate the surrounding natural environment. We are providing below information on the safe use and care of the private septic system - important information which every householder should know. We are also suggesting simple and effective water conservation techniques which should help to preserve our water supply and at the same time contribute to the long-term, trouble free operation of your septic system. An added bonus could be lower water bills (for those on municipal water supply) and even a drop in electricity bills due to less hot water consumption. 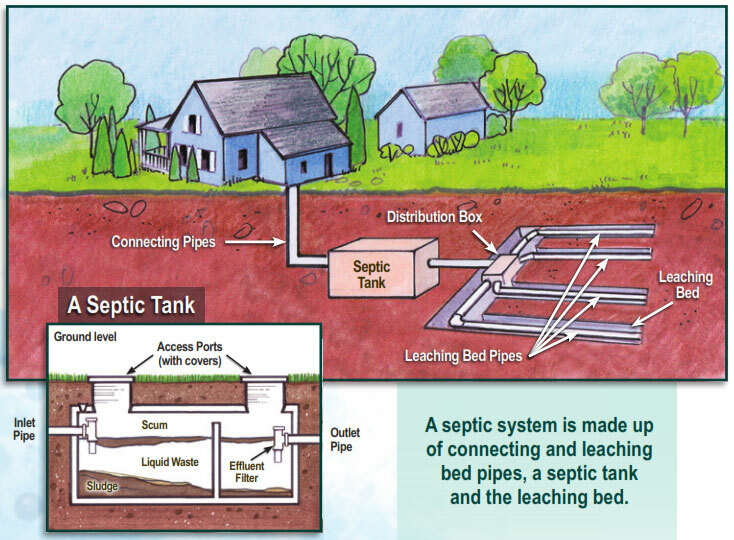 An on-site private sewage system (“septic system”) has two basic parts: a septic tank which receives the untreated sewage and in which solids settle out, and a leaching bed (tile bed) through which the liquid waste portion of the sewage is dispersed into the soil. The main function of the septic tank is to allow solids to settle and to let clear effluent flow to the tile bed. Biological reactions within the tank will break down some solids to liquids and gases, but the retained solids will eventually accumulate in the tank. Only clear liquid waste should be discharged from the tank to the tile bed. This liquid waste will then undergo further biological break-down and treatment. To ensure efficient operation of the entire system, it is important that the sludge, scum and solids which can accumulate in the tank do not enter the tile field. The septic tank should be inspected by a licensed professional at least once every two years and the tank pumped out when necessary - every three or four years is suggested. To find a licensed professional, check the Yellow Pages under “Septic Tanks - Cleaning”. Should you have any queries regarding your septic system which are not addressed in here, please contact the Dufferin County Building Department at 519-941-2362. Under no circumstances should a homeowner enter a septic tank. Noxious gases which are heavier than air remain in the tank after the cover is removed, and have caused death both to the original victim and to those who attempted to rescue a person from the tank. Entry into and inspection of a septic tank should be done only by a licensed professional. Do not alter the grade over the tile bed after it has been installed and inspected. This may affect its biological operation and result in malfunctioning of the system. The septic tank should be inspected at least every two years and pumped out when necessary - every 3-4 years or when the sludge in the tank is approaching the 1/3 full mark. If more than this amount of sludge builds up, there is a chance that particles can get into the disposal field and cause blockage and system failure. Keep water usage to a minimum. The more water used, the more that must be handled by septic system drain fields. See tips on Wise Water Use. Do not use the septic tank as a disposal system. Do not allow the following to enter the system: water softener backwash, paints, solvents, grease, coffee grounds, bones, cooking fats, filter cigarette butts, disposable diapers, paper towels, tissues, sanitary napkins, etc. White toilet paper is preferred as it breaks down faster and more completely than coloured. Organic based household cleaners are highly recommended. Moderate use of household drain solvents, cleaners, disinfectants, etc. should not interfere with the operation of the sewage disposal system; however, indiscriminate use may cause problems. Do not allow roof drains, sump pump discharge or surface runoff to drain towards the area where the tile bed is located. Water ponding upon the tile bed and saturation of soil within the tile bed reduces the overall effectiveness of the system by reducing its ability to dispose of liquid wastes. Vehicular traffic (including snowmobiles) should not be allowed over the tile bed as this may cause soil compaction and damage to the distribution pipe. In the winter, if snowmobile traffic is allowed to run over the tile bed, this can cause compaction of the snow and increase the depth of freezing, which has negative effects on the tile bed. There should be no need to use “starters”, “bacterial feeds” or “cleaners” in the tank. None of the compounds presently available have been proven in independent studies to be of any long-term benefit in the operation of a sewage system. The tile bed area should have an adequate cover of grass, good ventilation (sand or gravel) and adequate sunlight. It is important not to add excessive amounts of soil to the tile bed as this may prevent evapotranspiration. Objects such as patios, sundecks, swimming pools and tool sheds should not be located within 15 feet of the tile bed. Trees or shrubs should not be planted within 10 feet of this area and you should avoid planting shallow-rooting trees such as willows and cedars near the tank or tile bed.